Two large brick buildings at the Heath Street location are boarded up, and a fence along the street is covered with graffiti. A Boston developer who financed a real estate buying spree with loans from the now-defunct Anglo Irish Bank is locked in a legal struggle for control of a property empire that stretches from Massachusetts to Texas. The developer, John McGrail, who also owns prominent pubs in the Boston area, is trying to fend off an attempt by a new lender, Wells Fargo Bank, to recoup about $190 million he borrowed to buy property during the real estate bubble of the mid 2000s. Wells Fargo acquired his loans following the 2009 collapse of Anglo Irish Bank, which was taken over by the Irish government. The bank’s lawsuit alleges that McGrail, who previously fell behind on his debt payments to Anglo Irish, has failed to pay operating expenses on some of his properties and let others fall into disrepair, among other issues. McGrail in turn has sued Wells Fargo, contending the bank concocted a scheme to seize his property and has tried to disrupt his businesses in recent days. His lawsuit alleges, for example, that agents for Wells Fargo got a locksmith to drill through the door of one of his pubs, the Stadium in South Boston, and began boarding up windows and throwing food into the street. The legal fight is the latest to erupt over real estate purchased with debt from Anglo Irish, whose stunning failure helped trigger the collapse of Ireland’s economy and created myriad legal and financial issues for its US borrowers. Irish authorities have sued Anglo Irish’s former chief executive, David K. Drumm, who built the lender’s US operations and now lives in Wellesley after fleeing Ireland in 2009 to evade questioning. Irish authorities blame Drumm for fueling the speculative lending that led to the country’s financial problems, and in a suit filed in US District Court in Boston accuse him of bilking Irish taxpayers by illegally doctoring more than $10 million in loans he took from the bank before its collapse. While McGrail is one of many property developers in the United States and in Ireland who were funded with Anglo Irish Bank loans, he appears to have a close relationship with Drumm. Both are Irish natives. When he left Ireland in 2009, Drumm, himself facing bankruptcy, opened a financial advisory business in a South Boston office building owned by McGrail. According to court documents, McGrail also agreed to become of one of Drumm’s clients. Through a spokeswoman, McGrail, who lives in Boston’s Back Bay neighborhood, declined to comment on the nature of his relationship with Drumm or his legal fight with Wells Fargo. A lawyer for Wells Fargo also declined to comment. Starting in 2004, McGrail purchased a wide array of property in five states using about 20 different holding companies. He bought warehouses and shuttered industrial properties in Roxbury, pubs around Boston, and several apartment buildings in Dallas, Jacksonville, Fla., and other communities. He owns the Stadium in South Boston and the building that contains the Crossroads Pub on Beacon Street, as well as several 1970s-era apartment complexes on River Street in Mattapan. While the full scope of his real estate holdings is unclear, his legal battle with Wells Fargo focuses on more than 30 properties. In some cases he initiated redevelopment projects that stalled in the spiraling economy. He had planned a large mixed-use complex at 501 Dorchester Ave. that failed to move forward. 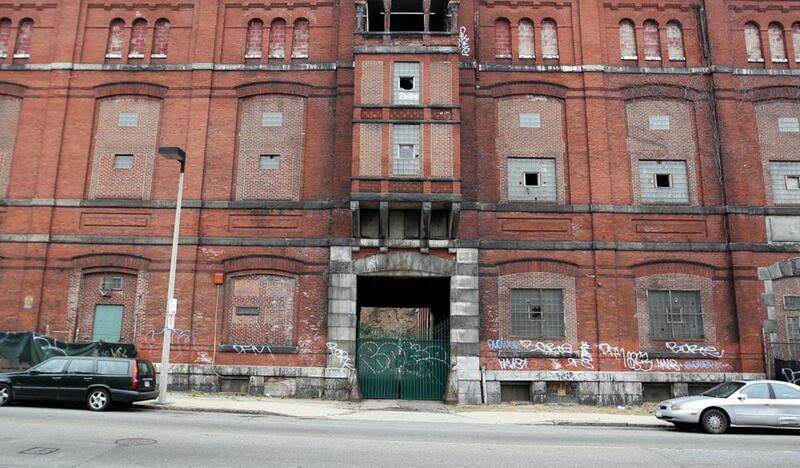 He also planned to build 83 condos at a former brewery on Heath Street in Mission Hill. Today, two large brick buildings on the site are boarded up, and a fence along the street is covered with graffiti. In its lawsuit, filed in US District Court, Wells Fargo alleges that McGrail has defaulted on a forbearance agreement previously granted by Anglo Irish in 2011, after McGrail fell behind on his loan payments. The bank alleges that McGrail allowed a Dallas apartment complex to fall into disrepair (that city has sued him for code violations), and that he failed to properly segregate tenant deposits and operating funds at properties in Florida and Georgia. Wells Fargo also asserts that he failed to maintain insurance coverage on Massachusetts properties in Lynn, Roxbury, and downtown Boston. McGrail fired back in his lawsuit, filed in Suffolk Superior Court March 9, by alleging that the lenders launched a “premeditated scheme’’ to seize control of his real estate holdings. The complaint states that McGrail had been trying to restructure his debt and sell some of his properties, and was blindsided by the sudden demand for full repayment. “The speed and efficiency with which [Wells Fargo] acted demonstrate clearly that they had planned an organized strike against [McGrail] well in advance,’’ the lawsuit says. In addition to breaking into the Stadium, the suit also says that Wells Fargo associates also tried to seize control of residential properties McGrail owns in Lynn, dismissing building management personnel and telling tenants to remit rental payments to a new landlord. McGrail also contends the lender deliberately delayed his efforts to sell several of his properties in the South to try to force him into a default. He has asked a court to grant an injunction to prevent Wells Fargo from making further attempts to take control of his property.